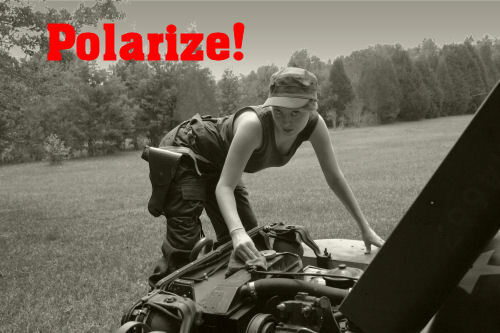 Jill, the Army Mechanic says, don’t forget to polarize when you hook up your generator and voltage regulator. Failure to do so may lead to damage of either unit (or both)! Polarity. Whenever generator or regulator wires have been disconnected, the generator should be polarized after the units have been reconnected and before the engine is started. If this procedure is not followed, the generator or control box may be severely damaged. 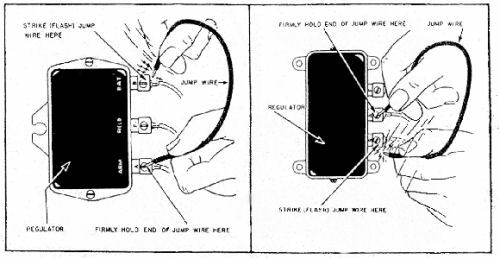 To polarize the generator, place one end of a jumper wire firmly against the armature terminal on the control box and then touch the other end momentarily to the battery terminal of the control box (see drawing above). This sends a surge of battery current through the generator and automatically gives the generator the correct polarity for the battery it is to charge. As was pointed out to me by Geoff Bull from the G503, the diagram on the right represents the standard jeep voltage regulator and other war-time MVs. The one on left is for other war-time MVs and apparently post-war CJs. The important facts are to verify the markings on your regulator and momentarily touch a wire from “A” (hold on “A”) to “B” (touch wire to terminal). Not all regulators are the same. The above information was edited from AUTOMOTIVE TROUBLE SHOOTING For WW2 Wheeled Vehicles, Volume 1 edited by Robert Notman.